The Strikeforce Heavyweight Grand Prix finally comes to a close this weekend when Josh Barnett and Daniel Cormier clash in the finals at the HP Pavilion in San Jose, Calif. Gilbert Melendez puts his lightweight title on the line against longtime rival Josh Thomson and Rafael Cavalcante looks for revenge for a 2009 knockout loss to Mike Kyle. The ProMMAnow.com (www.prommanow.com) staff join forces like the Super-Friends to bring you our thoughts and predictions on each of the main card bouts. JAY CEE: It is very hard not to go with Nah-Shon Burrell on this one, he is currently on a six fight winning streak and possesses some real knockout power in his hands. Spang is a good fighter but hasn’t knocked anyone out since 2009, he has also only had five pro MMA fights in his career so far. Burrell has not been a pro for as long as Spang but has had more fights then him, more fights means more experience, this combined with some decent stand-up tilts the scales for me. Pick: Burrell wins via TKO. ORON CRAWFORD: Both fighters are young exciting Welterweights with only one loss. Spang is coming off the first loss of his career in his last Strikeforce outing in January at Strikeforce:Rockhold vs Jardine. Burrell is undefeated under the Strikeforce Banner. I think Burrell will be the aggressor in this bout and Spang will be content to wait for counter strikes. I think the fight will go the distance and Burrell will get the nod by way of being the aggressor and landing more shots. Burrell by Decision. RICHARD MANN: Spang has looked rather mediocre during his two-fight Strikeforce tenure. Burrell should be able to bully the smaller fighter into the cage and take a decision. A few fights on the Showtime Extreme undercard probably deserved this spot a little bit more. Burrell by decision. JACK BRATCHER: Nah-Shon “The Rock-N-Rolla” is on quite a win streak at the moment with six straight wins, his last three in Strikeforce. Six of his eight total wins have come via knockout. Chris Span is 4-1 with two wins by knockout and is coming off a loss. Momentum can play a big role at times. Gotta go with Nah-Shon via TKO. JAY CEE: I like former KOTC and XMMA light-heavyweight champ Mike Kyle in this fight, both men like to stand and strike so it will be very close but I think Kyle has the edge. Most of Cavalcante’s fights are finished with a knockout so Mike will have to be careful, but if he can avoid the heavy hands in the early rounds and control the fight then he could win this via decision or a late knockout. Pick: Kyle via TKO or Decision. ORON CRAWFORD: Kyle was the heavy underdog in their first meeting back in 2009 when he pulled off the upset win by TKO’ing Cavalcante in the second round; he has won four out of his last five bouts since losing to Kyle, the one loss coming at the hands of Dan Henderson. I think Cavalcante will avenge his loss to Kyle. Cavalcante has won 10 of his 11 wins with his striking and that is how I expect him to win this one. Rafael Cavalcante by 1st round TKO. RICHARD MANN: Cavalcante gets the chance to avenge his dark match loss to Kyle back in 2009. He is clearly the more skilled fighter with the better technical striking game. However, Kyle still has huge power. If he can land a big shot early and get the ball rolling down hill, he will have a path to victory. Cavalcante should be in much better shape this time around and stay out of trouble. Cavalcante by decision. JOHN BUHL: I’m picking Feijao by decision, but this is still a dangerous fight. Not only did Kyle pull the upset the last time they fought, but Kyle showed he’s capable s knocking out most guys in the sport when he nearly TKOd Antonio Silva in a heavyweight bout. Feijao has the more dynamic striking, so as long as he weathers the early storm, I think he will win the last two rounds of the fight. JACK BRATCHER: This fight has about zero chance of going the distance. Kyle got the best of Cavalcante in their first match-up in 2009. The only fight Cavalcante lost since then was to Dan Henderson and the only fight Kyle has lost since then was to Bigfoot Silva. This one is really a toss-up for me. But if Kyle did it once, I don’t see any reason he can’t do it again. Mike Kyle via KO. JAY CEE: Lets face it, current champ Gilbert Melendez is a hard man to beat. Many will say that Thompson has beaten Melendez before so he could do it again, personally I disagree, since they last fought in 2009 Gilbert has greatly improved as a fighter and now has enough experience and confidence in himself to get the win for a second time. Thomson is dangerous on the ground but Melendez is no slouch in the BJJ department, I think the fight will go the distance with Melendez picking up the decision victory. Pick: Melendez via Decision. ORON CRAWFORD: Melendez already has a victory over Thompson and I think he will put another notch on the W column at the expense of “The Punk” again. Rumors have been circulating that Thompson is coming into this bout with a knee injury, if that is the case, Melendez might be able to finish the always game Thompson. However, the safe bet is Melendez will cruise to another decision victory by superior grappling. Gilbert Melendez by Decision. RICHARD MANN: The difference between their first fight and second says it all here. Melendez looked like a sloppy brawler in their first encounter. When they faced off for a second time, he looked sharper on the feet and controlled the fight from the outset. Look for him to continue to advance here and pick up a finish on the feet over the quickly aging Thomson. Melendez by late-round TKO. JOHN BUHL: Melendez by lopsided decision or late stoppage. We’ve seen how much Gil has improved since the first fight with Thomson. Thomson, on the other hand, is still the same fighter, and that’s assuming he’s healthy. Chances are after the long career he’s had, Thomson has an injury or two and once again hasn’t had a full, problem-free training camp. JACK BRATCHER: Gilbert is going to run through Thomson like Montezuma’s revenge. Thomson won their first bout in 2008 via decision. Melendez won the second fight via decision, and I think he’ll win this one via decision. Thomson has only been finished once so I don’t think Melendez will end the fight but he should win a convincing decision. JAY CEE: This fight is very hard to call, Barnett is on an eight fight winning streak and Cormier is undefeated with nine straight victory’s under his belt. The experience advantage undoubtedly goes to Barnett, but will that really play a factor with both men having fought in big fights in the past. Cormier has the better wrestling but Josh has great Jiu Jitsu so if the fight goes to the ground both men can handle themselves but Barnett will pose a threat with submissions. It could really go either way but I think Cormier may be able to pick apart Barnett with his striking and score a TKO. Pick: Cormier via TKO. ORON CRAWFORD: Fighters are high level grapplers, one has a world of experience in MMA and the other has an Olympic Wrestling pedigree. 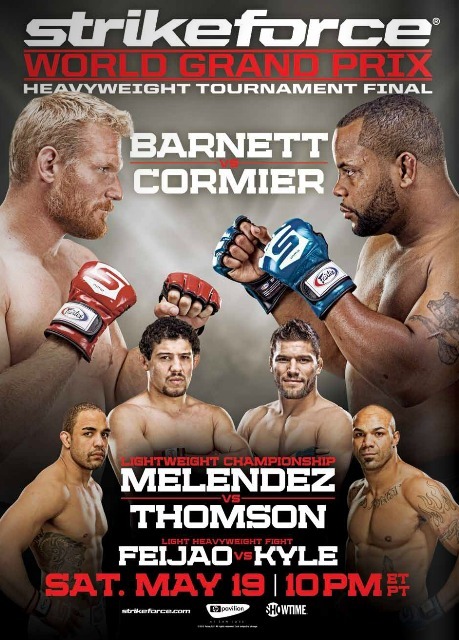 Although Barnett is the seasoned veteran in MMA I am picking Cormier to control the bout with his wrestling. Barnett can be dangerous with his submissions but I think he won’t be able to catch Cormier. The former Olympian has shown improved striking in his recent bouts and will have the wrestling advantage in this bout. Daniel Cormier by Decision. RICHARD MANN: Cormier is going to smoke Barnett. MMA’s premiere awkward professional wrestler has always gotten away with being a solid grappler and an okay athlete. He will have no answers for Cormier on the feet. He will not be able to get takedowns. If he ends up on his back, he will get shelled with punches. Look for Cormier to pick up the biggest victory of his young MMA career. Cormier by TKO. JOHN BUHL: Cormier by decision. I think he’ll have the better wrestling and maybe even the better (or more dangerous) striking, since we haven’t seen Barnett seriously tested in a few years. JACK BRATCHER: Barnett hasn’t lost since 2006 when he dropped a decision to Big Nog in Pride. Of course he has a lot more experience than Cormier in straight MMA bouts but Cormier’s game has developed nicely. His striking is looking quite polished and we all know how good his wrestling is. I don’t think Barnett is going to be able to do much with Cormier due to the style match-up and Cormier’s striking should be more technical. Barnett’s best chance of winning is via submission, like a leglock or something, but I don’t see it happening. Cormier via TKO.